About 88 percent of teenagers in the U.S. – aged between 13 and 17 – have access to a desktop or laptop computer. This share slightly varies according to ethnicity and household income. While 91 percent of white, non-Hispanic teenagers have access to a computer in 2015, about 79 percent of black, non-Hispanic teenagers had access to a computer that year. In total, about 74 percent of girls have access to a smartphone, and 62 percent of them also have access to a tablet. For the boys, this share stood at 71 percent and 54 percent respectively. 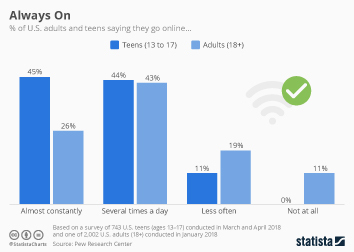 As a large share of teenagers has access to these connected devices, parents in the U.S. often discuss acceptable digital behavior with their teens. The behavior teens should have at their school, home and social lives is the most frequently discussed topic between them. Both parents and online teens share a concern for preventing identity theft, as this was considered one of the most important online safety topics according to them. In the second quarter 2016, teenagers spent an average of 465 minutes online via computers on a monthly basis. This figure is significant lower in comparison to other age groups. For example, during the same measured period, online users aged 18 to 24 years spent an average of 2,094 minutes online via PC per month. In terms of online video, on a monthly basis, American teenagers spent an average of about 778 minutes watching online videos. Again, this share is considerably lower when contrasting to figures of adults aged between 18 and 49 in the U.S. Besides of interacting with videos online, some of the most popular digital communication methods of teens in the U.S. are instant messaging, social networking and emails. Snapchat has taken over as the leading social media and networking sites used by teenagers and young adults in the U.S. About 72 percent of internet users aged between 13 and 24 used Snapchat in 2016. The majority of teenagers and young adults use Snapchat to see snaps/stories of people they know, and 69 percent of respondents stated chatting with people they knew on a daily basis. Instagram is also popular among teenagers in the U.S. – about 24 percent of teenagers in the U.S. stated a preference for the image-sharing app – especially among girls. About 64 percent of girls aged 15 to 17 years used the social networking app. Despite the rise of visual driven social networks, many teenagers aged between 15 and 17 years still use Facebook. About 78 percent of boys in that age group stated using Facebook, and 81 percent of girls used the social networking site. Despite the heavy use and presence on social networks, about 43 percent of teenagers in the U.S. have not met friends online, and only 36 percent made friends online via a social media site.